Live in the mindset of abundance and not in the mindset of scarcity. The abundance mindset gives you the feeling that there is enough for everyone and you share it. The scarcity mindset gives you the sickening feeling that there will not be enough for you, your family and anyone else so your horde. 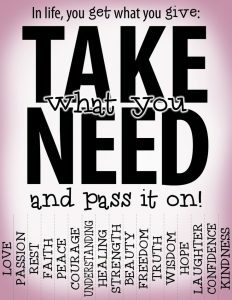 I have joined the “Take What You Need” movement to help spread the abundance mindset around the world. Take What You Need was started by Katie North from Dallas, TX in September 2011. She made the first sign and posted it on her college campus and now thousands of them have been spread around the world. I have created my own version of the downloadable PDF flyer and distribute to help spread the hope of abundance all around the world. This website is dedicated to living simple, minimalism and living the freedom lifestyle. I focus on less is more and love what you have. I believe people are more important than stuff. Creating memories and experiences with good friends and loved ones rather than wasting precious time working for and collect things that collect dust in our closets, basements, attics, and garages. The YouTube star Coby Persin tapes $1 bills all over a suit and walks around Manhattan with a sign telling passersby to take what they need. I bet you can guess what happened. Will those that need the money the least take the most? Check out the video and you may be surprised or disgusted. Do you see yourself in any of the people in the video? Be the change you seek. Live your life with the abundance mindset. Take what you want and share the rest. There is enough for everyone’s needs but there may not be enough for everyone’s wants. Live simply without extraordinary waste (here are some tips to help you). Downsize, Reduce, Reuse, Recycle and Restore. Spend more time doing what you really would like to be doing and make a difference in your world. Spend your precious time making GREAT memories with good friends and family. Begin Living The Freedom Lifestyle today!